Picture your perfect motorcycle jacket. Does it have obnoxious logos printed or stitched everywhere on it just to promote a company? Mine doesn't, but not because I'm anti-corporation or anything, I just think that running into a fellow motorcyclist and striking up a conversation to learn more about their gear is more interesting. Does your perfect jacket turn you invisible so you're dodging every other vehicle while driving through the night? I don't know about you, but the only place I'd like to have an invisible jacket would be in the girls' locker room. 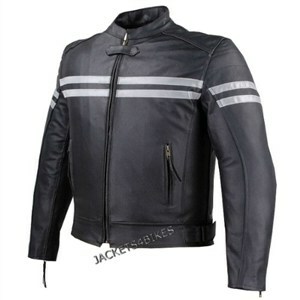 There aren't many jackets out there that are perfect, but this Track Motorcycle Leather Jacket has great qualities. From Just4Bikes, this jacket utilizes everything you want in something you're going to own for a long time. It's made of premium cowhide leather, and its removable armor and liner make it easy to clean and keep cool in the summer. The reflective stripes keep you seen at night, and it's adjustable in the waist just in case you had a big dinner that night. It also has zipper cuffs and two front zipper pockets. It's kinda stiff when you get it, but after a couple of weeks it'll break in like a good pair of jeans.